Pictured: The Namibian warship, NS Elephant, spotted near the mouth of the Kunene River and at its berth in Walvis Bay. The blatant theft of fish in sensitive areas vital for the breeding and spawning some of Namibia’s most precious fish resources by foreign flagged fishing trawlers prompted direct action by the Namibian Navy. The Namibian Navy Ship, Elephant, was spotted in the area between Cape Fria and the Kunene River mouth shortly after fish pirates were caught red handed while decimating vital horse mackerel breeding stock in the shallow water just behind the waves at Foz de Kunene. The presence of the Namibian warship saw the fish pirates running north for friendlier waters off the coast of Angola. A tourist to the area only reachable by certain types of aircraft or four-wheel-drive vehicles and rarely visited by people, photographed the warship close in to shore on the strip of coast line between Cape Fria and Foz de Kunene. When presented with photographic evidence of the fish pirates caught in the act of stealing Namibian fish during the second week of December the Minister of Fisheries and Marine Resources, Mr. Bernard Esau, reacted with shock and said the actions of the Angolan fishing vessel are tantamount to inviting war. “Not only is the vessel in Namibia’s territorial waters but as it can be seen to be within 200 metres from the shore. The area close to shore is where most fish species breed and spawn and if they are trawling this close to shore they are destroying one of Namibia’s most valuable resources,” Minister Esau said the time. 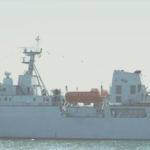 The Namibian warship was spotted in the area where the pirates operated a day or two after the minister had regard to the photographic evidence. Although no official confirmation about the deployment of the NS Elephant to the area where the foreign trawler was seen operating because of national security reasons, Colonel Petrus Shilumbu spokesperson for the Namibian Defence Force, was only willing to say that the Namibian Navy has been going to sea to defend Namibia’s territorial waters since its inception. The Namibian Navy is mandated to conduct operations in defence of the Republic of Namibia but it also conducts operations other than war in support of the national interests. The NS Elephant is a Chinese-built multipurpose warship that has been in service of the Namibian Navy since 2012.